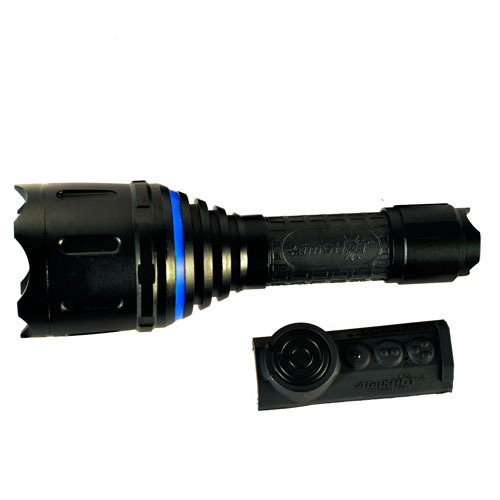 The revolutionary TZ980 is a unique flashlight designed by AimSHOT from the ground up as a weapon mounted adjustable focus light for hunting and tactical use. It is the only adjustable beam light on the market that is waterproof, recoil proof, and has a fully adjustable output from 5-100% output using the wireless rail mounted pressure switch. The beam pattern is easy to adjust using less than half of a rotation of the bezel to adjust from wide angle to narrow beam pattern. At the widest angle, you can see approximately 40' wide at 100'. As you turn the bezel to zoom in the beam pattern, the light output is condensed into a 10' wide cone of light. Use the wide angle to find your prey, then zoom in to identify and track your target. The adjustable beam allows you to match the field of view of magnified optics for varmint hunting and other night time use and is available in white, green or Infrared versions. - Diameter at bezel: 2.25""
- Diameter at handle: 1""